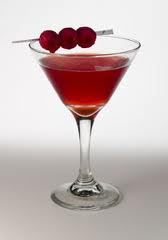 THE MARTINI CHRONICLES: Martini Thursday....Raspberry Peach Martini!!! Greetings Divas and Gents! Can I take a brief moment to say that I am so happy to be back to blogging regularly! Life has been so busy over the past few months...both at work and at home. As a result, my blogging schedule has suffered...how raggedy of me! But I'm back! And I have decided that I will be making a greater effort to be the blogger that you all have supported over the past (almost) two years. Now that I've had my moment, I wanted to share a new martini recipe with you all...it is, after all, Martini Thursday! This week, I present the Raspberry Peach Martini! This recipe started of as a smoothie, but I managed to turn it into a spirited drink for my Chronicle readers. I hope you like it! 1. In a shaker, combine Vodka, Chambord, Peach Schnapps, and Ice. Shake! 2. Drop a few raspberries into a chilled martini glass. Easy! Enjoy your Raspberry Peach Martini, and have a great weekend. Drink Responsibly!